This entry was posted in HORDALAND and tagged bilder, foto, Hardanger, Hordaland, images, nature, Norge, Noruega, Norvège, Norway, Norwegen, panorama, photo, Sørfjorden, SeeNorway, Ullensvang. Bookmark the permalink. Indeed! This was shot by my friend out West. Wow!! The depth is astounding, and the photograph beautiful! On behalf of my friend out West (who ha shot this scene)Thank you! Crazy! And we have live volcanoes under the sea. Which I suspect exist up north as well (Iceland leaps to mind). Boiling up through the frozen surface! What a wonder this world is! Yes, I’ll second that! Hawaii is on the top of a ‘hot spot’ and new islands are popping up at intervals, however, Iceland is a bit different. In the middel of Iceland the ‘geo-plates’ are slowly drifting apart and break Iceland into 2 separate islands. What will happen next is very difficult to imagine . . .
50 000 years I really wouldn’t know? Stephen Hawking gave the human race 100 years to get off to another planet, and in such a setting 100 years is like the blink of an eye . . .! 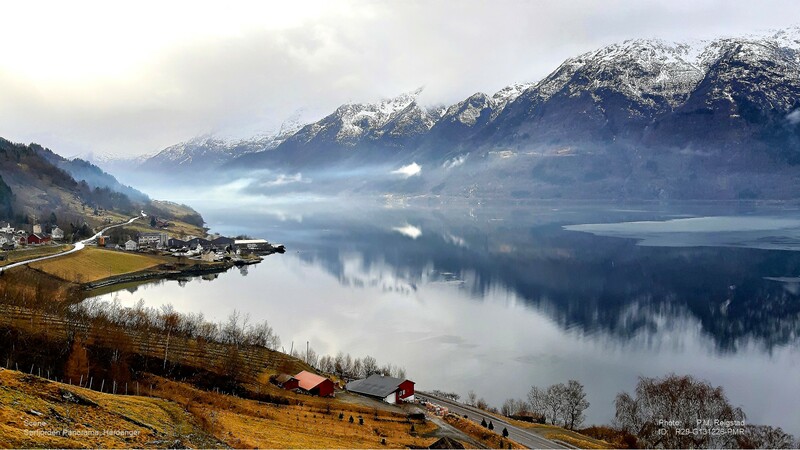 The countryside is rather steep up there – for regular farming – but,- we’re talking about the Hardanger area, It could be a small fruit (apple) plantage. The mist or fog adds a bit of intrigue to the picture. Beautiful view for those that live in what appears to be a farmhouse.